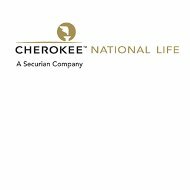 Cherokee National is not a health insurance company; instead, it is Cherokee National Life, a Securian Company. Securian is an insurance and financial company that sells commercial insurance to financial companies. Enter your zip code below and get your free online health insurance quotes right now! J.R. Miller founded Cherokee National in 1956. Despite the name, this is not a company that specializes in services for the Cherokee Indian tribes. Cherokee has an A.M. Best financial rating of A- with a long-term outlook of stable. Cherokee National’s sister companies can do business in a variety of other states if you are interested in purchasing one of their products but they are not licensed in your state. However, before you go and visit them in person, they only advertise this as their mailing address. What’s more, they specifically ask to be contacted by phone if you have any questions regarding the services that they offer on their website. It appears as if Cherokee National does not have their own agents, although they do not specifically say this on their website. You can make this assumption because they only have one office to choose from and they do not have an agent contact on their website. Of course, this also means that they do not have an agent-finding tool on their website either. This means that you will have to call them at the number above or use their contact us email to get the information that you need. On the Securian website, they do provide a find an agent tool so that you can locate an independent agent. There is no guarantee that an agent selling Securian products will also sell Cherokee National Products. Cherokee National does not have a career area on their website; however, Securian, their parent company does. You will find that any positions that are open for Cherokee Nation will be posted on the Securian website. According to Securian, their company and their subsidiaries, like Cherokee Nation, are great companies to work for and have a very low turnover rate, less than 7% turnover, because of the benefits and great working environment they offer. Cherokee National does not have an online claims center for you to file your claims. As such, you have two options for filing claims. Your first option will be to contact your agent and ask them to file a claim for you. The other option is that you can contact the claims line at Cherokee National. They have two claims lines, one for life insurance, and one for P&C claims. There is no information about the hours of operations for the company or the hours of operation for their claims. Most companies have a voice mail system in place if you have a claim after hours. If this is the case, you should leave a detailed message about your claim, your policy number, and your contact information so that the claim can be processed as quickly as possible. Cherokee National does not offer a quote tool option on their website. The only way to get information from them directly is to call them. They do have an agent tag for agents to sign in and get a quote for their customers, so you will have to see an independent agent to get your quote. Cherokee National does not sell health insurance. Because of this, you will want to look for quotes from other sources. You can get your free health insurance quotes right now by entering your zip code below.